I’ve sunk hundreds of hours into the Warcraft franchise over the years. I’ve raised several characters to max level in WoW, and have rerolled enough alts to be diagnosed with multiple personality disorder. Before that I was honing my skills in Warcraft III, winning enough matches to unlock an avatar for my online profile and replaying the single-player campaigns on Hard difficulty. Over time, I became invested in the world’s lore. I scoured dungeons for in-game books or, when I wasn’t playing the game, devoured spinoff novels about my favorite Warcraft heroes. But as my affection for the Warcraft franchise grew, so too did my curiosity about its origins, both in terms of story and gameplay. 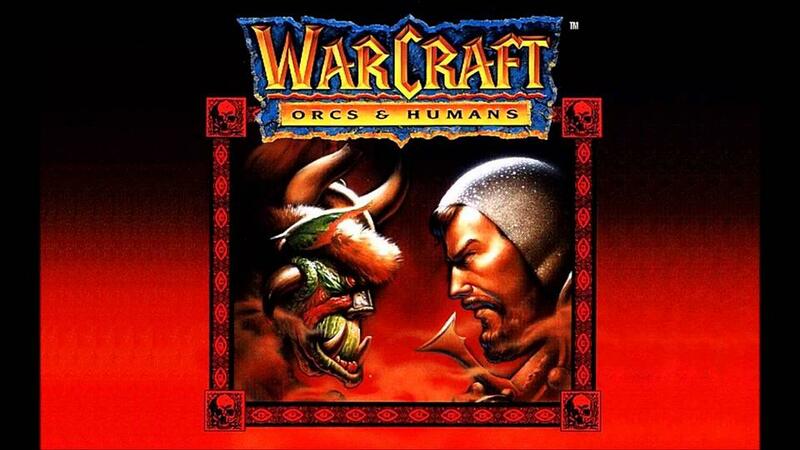 I had somehow missed playing its earliest title, Warcraft: Orcs and Humans. So I resolved to play the whole game, not only to gain a fuller appreciation for a world I’ve spent so much time in but to see its humble beginnings and the lessons Blizzard learned before they took over the real world. I didn’t own Warcraft growing up, but I managed to find the game disc for a dollar at my local library’s used book store. Actually getting the thing to run required a DOS emulator called DOSBox (bless their souls). I downloaded that, moved the files from the game disc onto my hard drive, set up all the directories, read A LOT of tutorials to figure out what I was doing wrong, and finally saw results. This seems like a lot of effort for a techno-simpleton like me just to play a 20-year-old RTS game, but I was committed. Without a Warcraft digital remaster to save me, there was simply no other way to play the game. And to be honest, I’m glad it was as hard as it was. I’m in love with the idea of experiencing something as close to the way I would have when it first came out, remakes and remasters be damned. Sure, I had to do some DOS gymnastics to get there, but playing a game as close to its original form is essential to a proper Retrograding. 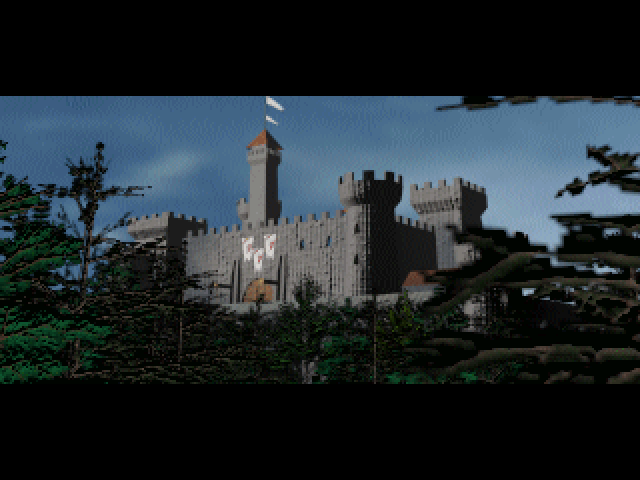 Starting with the orc campaign, I was immediately charmed by the animated mission prologue (voiced-over by Blizzard alum Bill Roper) and blocky 2D graphics, faithfully represented by the wizards at DOSBox. I’m happy to accept old graphics as part of the Retrograded experience, but I found that the vibrant character portraits, unit models, and spell effects stand out in a way that I’m sure must have wowed gamers in 1994. In full screen mode (Alt+Enter) the pixels look enormous on my 23” monitor, but they’re part of a retro aesthetic that doesn’t feel overdone like the 8-bit look is. Granted, no one’s banging down the door to return to the feel-good look of mid-90s RTSes, but I can’t help but give kudos to Blizzard for creating a distinct look for what would become one of their flagship titles. Things get a little cringey at the opening cinematic, but we all know my feelings on those. Still, even in 1994 I could tell Blizzard was balls-out going for it, and look where they are now. 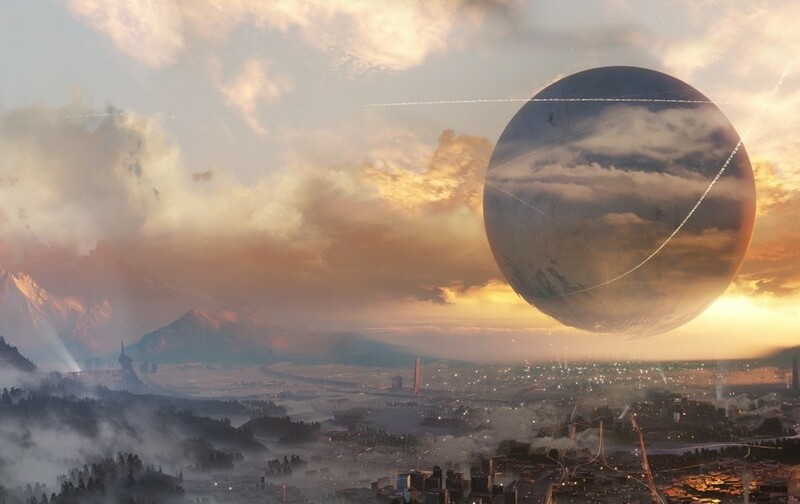 The image that would start a long tradition of quality cinematic game intros. In my opinion, music has a much easier time than graphics do of lasting through the ages, and Warcraft‘s is no exception. There are unique scores for both orc and human campaigns, and overall the soundtrack has a good sense of forward momentum. Filled with militaristic snare marches and medieval-sounding synth patches, it’s exactly the kind of music you want when you’re building armies for war. I did find the melodies in the human music a tad more memorable (maybe that’s just racial preference), but the ambient bass and scattered timpani drums of the orcish score created a mood ripe for invading. As an added bonus, popping the CD in the disc drive or any other CD player starts playing the soundtrack, a feature I was all too delighted to discover. Now I can Warcraft on the go! So it looks acceptable and sounds great – but how does Warcraft play? 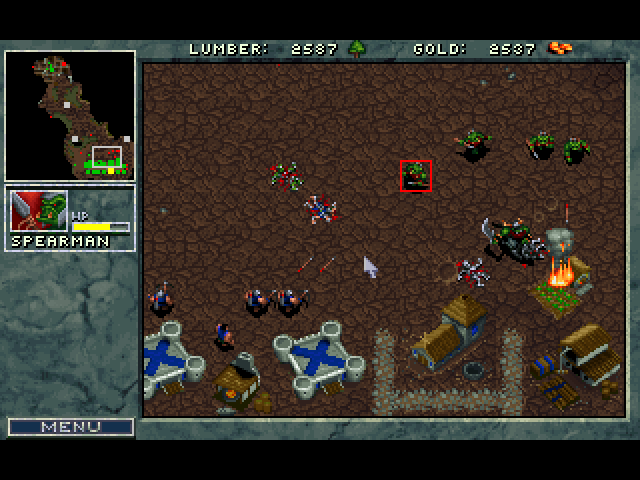 Warcraft follows a typical RTS playstyle: gather resources, build a base and army, destroy your opponents. I did this for years in Starcraft, and I did it for many more in Warcraft III. These later games didn’t stray far from their ancestor, however, Blizzard did tighten up the resource management aspect of what would become the standard ‘craft series gameplay. In Warcraft you’re still balancing two limited resources that require you to scout out for more once you run out. But over the course of my playthrough I was constantly baffled by the inconsistent placement of the starting gold mine. Sometimes it’d be right next to the base, and other times it’d be halfway across the map. I guess you could argue it made for a more tense experience, but I found it annoying to have a huge train of peons trekking across the map only to have them too far to be protected from calculated raids from the AI. I doubt this was intentional; how many board meetings could they have had about gold mine proximity? Rather, I see it as my first whiff of Old Game Oversight, and it’s one that Blizzard’s later RTSes have vastly improved on. Warcraft III’s resources are placed strategically and consistently, while Starcraft II’s mineral fields and gas geysers are a major part of its strategic metagame. When it came down to the “war” part of Warcraft, the game’s AI pathfinding isn’t the greatest. Moving units in my army to a central location would result in them splitting up and getting snagged on trees, lake edges, as well as each other as they funneled into the enemy camp in a snipe-able, single file line instead of an intimidating mass. I also found it challenging to make unified attacks when I could only command up to four units at a time (thank goodness that unit grouping was a thing even back then). Compared to the responsive army movement I was used to in Warcraft III and Starcraft, this was my first major difficulty hurdle in whether I would complete the game successfully or not. But I persisted, and I found I was able to abuse the AI in spite of this handicap. If the enemy sent groups to attack my base, they usually wouldn’t stop moving until they reached their destination. If I intercepted them before they got to my base, I could usually kill them with far fewer casualties, and I’ll admit I ended up reloading saves a lot to “catch” the AI in these moments of dumbness. And since Fog of War doesn’t dissipate in Warcraft like it does in later games, I was able to see them coming from in-game miles away. While it seems like I developed a major breakthrough in busting the AI, there were still moments where the enemy showed signs of near-omnipotent competency. Remember the Fog of War? Unlike me, the AI could see the entire map at all times, meaning I couldn’t sneak anything past it. I was no stranger to this, since the computers in Starcraft and Warcraft III always seemed to know where my armies were to engage me in battle, but Warcraft’s AI seemed especially dedicated to ruining my plans. No secret two-pronged attacks, no hidden resource gathering; the AI always shut down whatever trickery I employed from multiplayer matches in Warcraft III. And you know what? I was actually titillated to have to modify my play style to counter the game’s militant nature. It became one more challenge to overcome in addition to my mission objectives. Big frontal assaults were useless since the enemy knew where I was and when I attacked, so I focused on building spearmen (archers for humans) to draw enemies out a handful at a time, so I could crush them with my larger force that waited a short distance away. Even then I couldn’t get overzealous with this; if too much of my army began to move forward, the floodgates would open and the enemy would come pouring out to smash me. No amount of micro could save me, but I’m genuinely curious if there are Starcraft-level players out there who can work Warcraft’s UI the way they do in the championships. Not that there’s that much to micromanage anyway. Grunts, spearmen, raiders, and catapults (footmen, archers, knights, and ballistae) are all basic attackers; spellcasters add a bit more variety, since using spells or attacking both drained mana. I found it far more interesting to use these magic skills, as their effects were usually enough to turn the tide of battle. Orc necrolytes can raise the dead (more dumbass troops to throw into the fray is always a good thing in my book of the dead), while the warlock can summon spiders and a giant sword-wielding daemon. Human priests can heal, an absolutely invaluable skill for keeping expensive units (including ballistae!) alive, while conjurors are essentially the same unit summoners as the warlocks. Heals are manually cast, which got dicey during big fights where the only way to see a unit’s health was to have it selected. Starcraft and Warcraft III definitely improved on this, and I appreciate now more than ever what a godsend auto-casted spells are compared to this antiquated method. I admit I actually slowed the game speed down a couple times to optimize my heals, which isn’t something I would have done if that function wasn’t part of the original game. If I could conceive of doing it back in ‘94, I’ll sure as hell do it now if it’ll get me closer to beating the game. Even though many of the units were essentially copy-pastes of each other, having different skins and slight variations (the water elemental’s far-superior ranged attack vs. the daemon’s up-close-and-personal melee strike) made the orcs and humans feel diverse. Warcraft III expanded on this idea, where even dummy melee units could eventually be upgraded to have cool abilities. 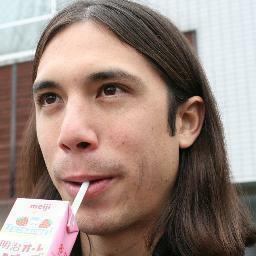 But Starcraft is where Blizzard really took this diversity to the next level. Starcraft features three completely unique races that differ in every way – from their aesthetics to the way they construct buildings, Starcraft created a new standard of making gameplay more unique depending on what race you chose, something they would continue to tweak from then on.